Pear trees are grown both for decoration and for their delicious fruit. 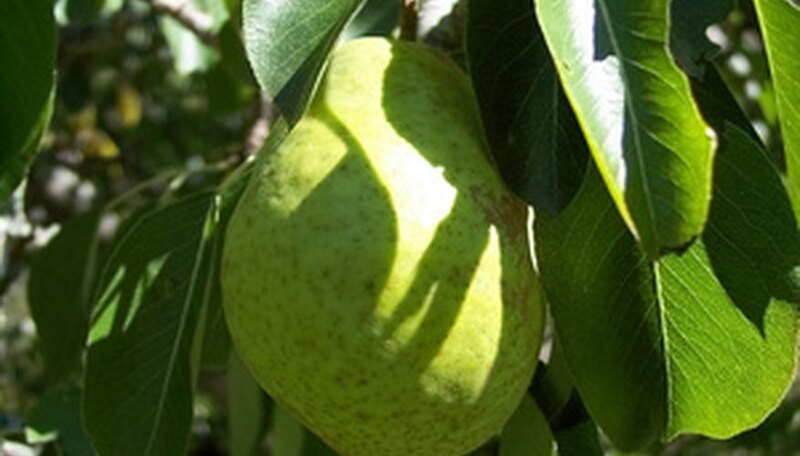 There are three varieties of pear trees grown in the United States, which include European (also called French) pear, Oriental pear and Asian pear. European pears are the widest know variety. Asian pears are called the apple-pear for their apple-shaped fruit. Pear trees require a soil with good water drainage, according to Texas A&M University, but can tolerate heavier soils such as clay and heavy loam soils. Pears require planting in an area that has good sunlight. When planting, the hole should be slightly larger than the root ball spread, according to the British Columbia website. Peat moss and compost additions to the soil improve drainage around the roots and help the pear through the early establishment period. Pear trees that have excessively vigorous growth are more susceptible to fire blight than trees allowed to grow normally. Too much fertilizer will encourage growth. When a pear tree is planted, a half cup of a balanced fertilizer such as 13-13-13 is all that is needed. Another 1/2 cup is required every spring as soon as new growth begins until the fourth year, when the amount is increased to 2 cups. Fertilizer application is halted if fire blight appears. Pear trees require pruning to keep fruit production high. Late winter at the end of the dormancy period is the best time to prune pear trees to prevent stressing the plant, according to the Ohio State University Extension. Removal of dead or diseased branches is the first step of pruning, making cuts just above a healthy bud. Dense areas of branches and foliage require thinning to allow more light into the canopy of the tree. This increases air circulation and light inside the tree's interior. Fruit should be thinned later in the season so there is at least 8 inches of space between fruits. Pears are best harvested while the fruit is still green as the fruit will continue to ripen after it is picked. Pears left on the tree until the skin turns yellow will begin to break down. Pears that are light green (not grass green) are ready for harvest. Pears require ripening at room temperature for a period of one to two weeks. Pears are susceptible to a wide variety of insects, including pear-specific pests such as pear psylla, pear slug, codling moth and pear leaf blister mite. A combination of insecticide and pesticide sprayed together will prevent most insect infestation and fire blight. Chemical sprays containing streptomycin applied at five-day intervals once the pear tree exhibits first bloom will prevent most disease. The application of lime sulphur will prevent the development of powdery mildew disease on the tree. All-purpose insecticidal soap will kill many insects that affect pear trees. Bacillus thuringiensis can be used to kill off leaf-eating moths during the summer.